We had 8 crew and an apprentice turn up for the Operations Session for Wednesday 27th December. We almost had more Victorian modellers in attendance than NSW modellers. I might have to start imposing sanctions on Victorian Modellers if they keep multiplying. It didn’t start well when Greg declared JMRI a failure and we had to resort to Procabs and Procab-Rs only. Arthur diligently sat in the North Coast Controller’s chair for 3 hours and had trains running smoothly. Well we ran 37 trains to completion. 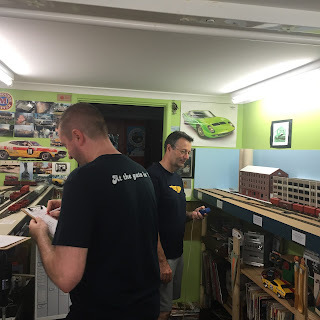 It seemed that towards the end of the session, the crew just sat down as the clock neared the end of the session, not wanting to start a train and leave it out on the layout just before a break for crib. I was the only person operating, with the rest just watching me, and Arthur directing. Now there were about 7 issues registered from the session. One 80’ container wagon lost a coupling. So the 0-5-0 hand of god removed the troublesome wagon (for later fixing) and operations continued. The North Coast Motorail was listed twice as having bad couplers (mismatched coupler heights) - once traveling to Murwillumbah and once travel from Murwillumbah. I’ve gone and checked things out on Thursday and everything lines up? I gave it a run and it works OK now. Maybe someone adjusted something during the session. I super glued the coupling back on the wagon and returned the wagon to the train. I fixed up a loco with dirty wheels, and took a file to two pieces of track that were slightly out of height alignment. So that was not a bad result from the Operations Session. However, when the session completed, there were still 12 trains to run. So on Thursday afternoon, I ran 5 trains and advanced the fast clock from 6:30pm in the timetable until 8:00pm. I also slewed the last 40 cm of number three track in South Brisbane Interstate Yard by about 4-5mm and now the new wooden unloading platform that I made during the Christmas break sits on the other side of trains in the station platform at South Brisbane Interstate and between track 3 on the other side. I still need to add a few more legs to the modelling platform and add some more detail to the deck, but for all intents and purposes, it is all complete. 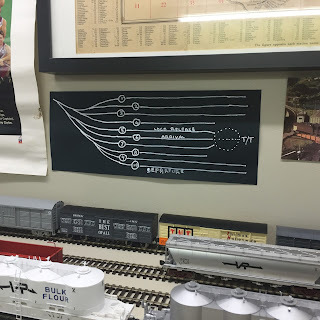 On Friday I had 4 people over, Lefty (and Son would have also been over if he didn’t work all night doing oncall), Arthur, Marty (NMRA Div 1 super) and Shelton. Well wouldn’t you know it – two more Victorian Modellers. We took the timetable from 8:00pm up until midnight. Had a coffee or cold drink and had a bit of a chat. So that meant that the timetable had been completed successfully. Apparently Lefty advised that he did not know the various locations were and where the various control panels are for each location. But that is natural for people with very little experience on the layout. On Friday arvo I ripped up two sweeping dual gauge curves that I had laid between Acacia Ridge Yard and Clapham Yard. These were laid with my own scratch built dual gauge track. It was HO flex track on which I soldered up a third rail of code 83 to make it dual gauge. 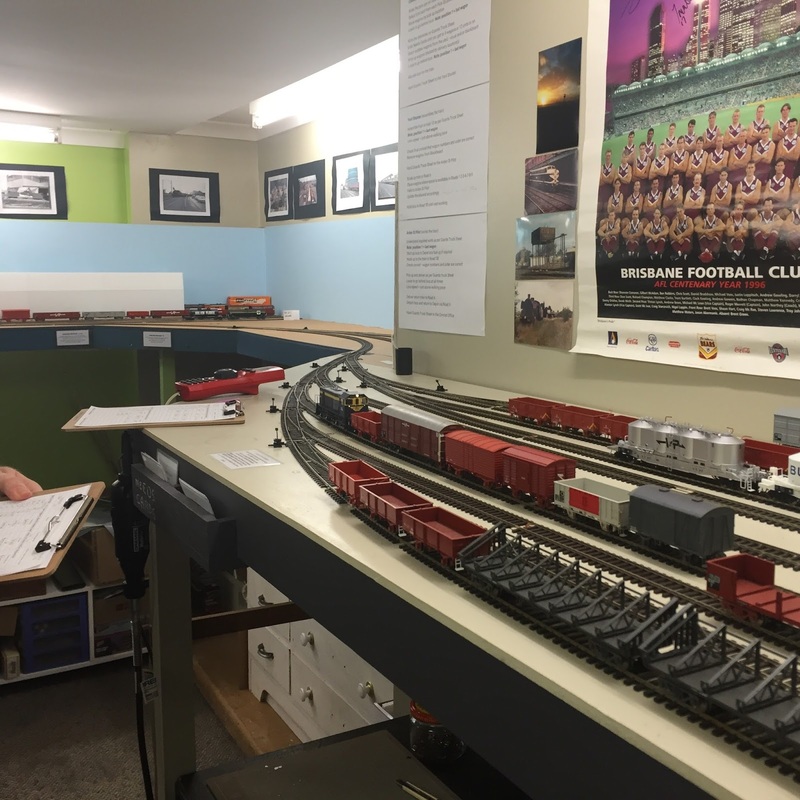 On Wednesday morning I placed an order with Queensland Scale Models for some lengths of Tillig dual gauge track. What service – it turned up on Friday morning. 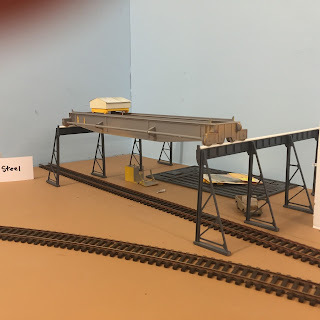 So the new dual gauge track was substituted for the home made dual gauge that kept causing my 12mm trains to derail around the bend, as I could not keep it in gauge. 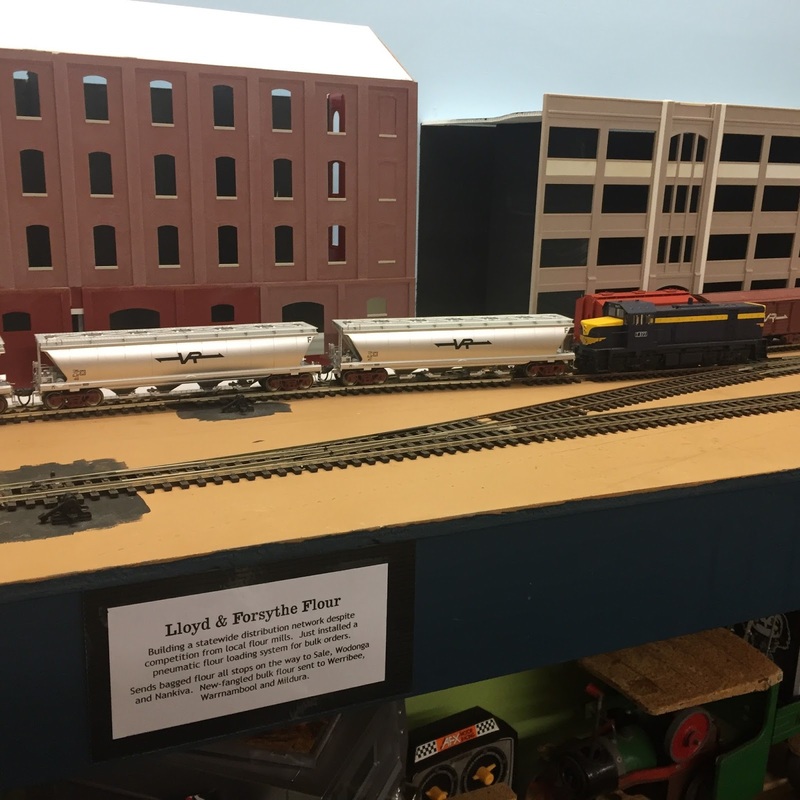 It worked on some other areas on the layout, but not at these two locations. I then ran my narrow gauge train between Clapham and Acacia Ridge and back. I also found one narrow gauge siding at Acacia Ridge that was not wired, so out came the drill and the soldering iron and voila – that is now fixed. Just after Christmas 2017, and looky here. Santa has turned up for an Operations Session. At Border Loop, a ballast train waits for another train to overtake. This scene shows a photo from the web, that I have tried to replicate in my scene at Border Loop. Here is the freight train to South Brisbane Interstate coming through on the main at Border Loop. Further north, the freight train has made it to Acacia Ridge Yard. Some activity on Fairy Lane, an ambulance is passing a scene of some roadwork. Just nearby Fairy Hill Loop, a triple loco set powers a long container north towards Fisherman Islands. It is passing Ron and Marg's B&B. Looks like PK is staying a night in the bedroom and Lefty is trying to work out what PK is doing. maybe Lefty is taking notes. At Acacia Ridge Yard, two trains from the Ops Session are visible. The Ballast Tamper on track 5 and the ARHS sponsored CPH with trailer doing a run from South Brisbane Interstate Platform to Kyogle platform and return. It is captured here heading back to South Brisbane. Oh Look, a stock train lead by 4894. It is here at Nammoona. Remember this fact for a future up coming post. The Stock Train at Nammoona from another angle. On the facia of the layout are a collection of Tea Bag Tarpaulins before they were cut down to HO size. These ones are being made in Victorian and SAR colours for my modelling mates. This week we had 11 guys visit Cassino on Tuesday Nighter for our fortnightly meeting. We met in a rather hot shed, where the guys wandered around to see what had changed since their last visit. This was actually Cliff’s first visit to the Shed. He was blown away by what was there. We found out the Cliff was a former copper stationed at Casino many years ago, and he could associate with some of the scenes. It is a small world isn't it. Saturday I went over to the Club to assist with the fixing of a short occurring on a diamond crossing from Tillig that handles the crossing of 12mm and 16.5mm track. When I got there the guys had advised that they had figured out how to wire the piece of track. When they described their method, I agreed with them that they had it correct. A bit later we tried to run a train through the track and it did not work. I think they better start from scratch and disconnect all the wires from where they are currently connected. They need to then connect one wire at a time and check with a multimeter. Sometimes it is hard to get good help. The main reason for venturing over to the other side of the universe - sorry town, was to attend a running session at Mark's Place. 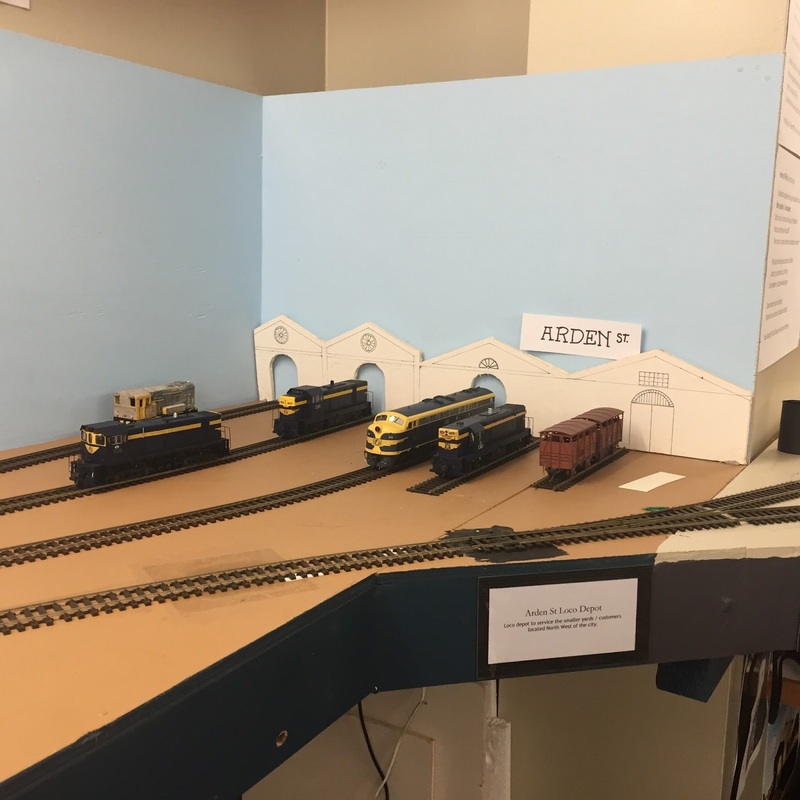 His layout is called Arden Street. It is very nice and is coming along very well. It is heavily geared towards operation. It has a card system where you draw some cards and then make up various trains based on the cards up to a maximum wagon length. 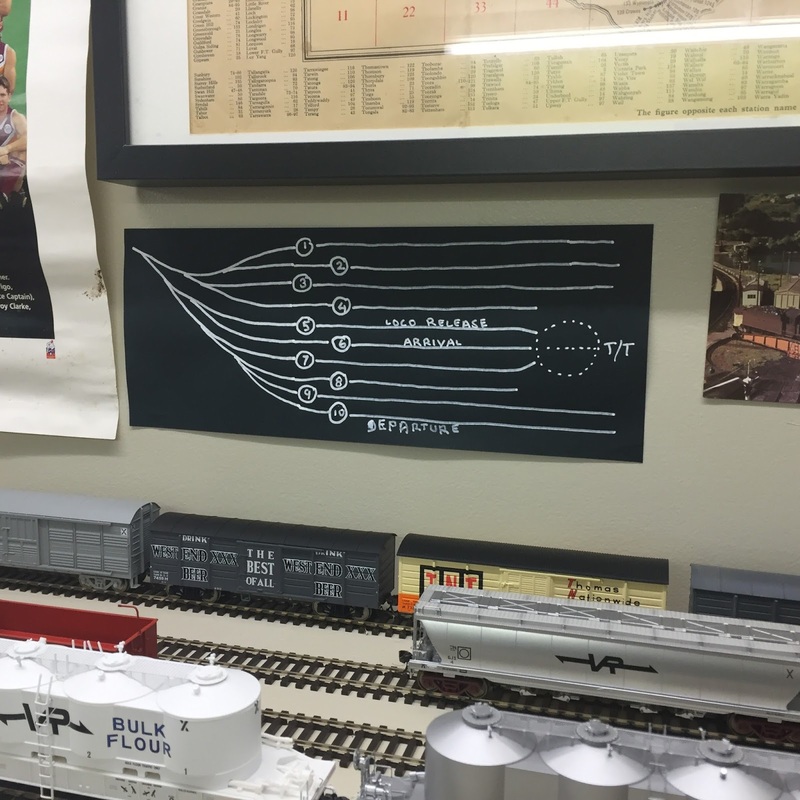 It is certainly a tester for the brain, both in the creation of the train list and putting the train together and then shunting that train and bringing back any returns. While it was reasonably warm in the train room, I think most of the sweat that I produced was from the brain working overtime to solve the shunting puzzles created for each operation. 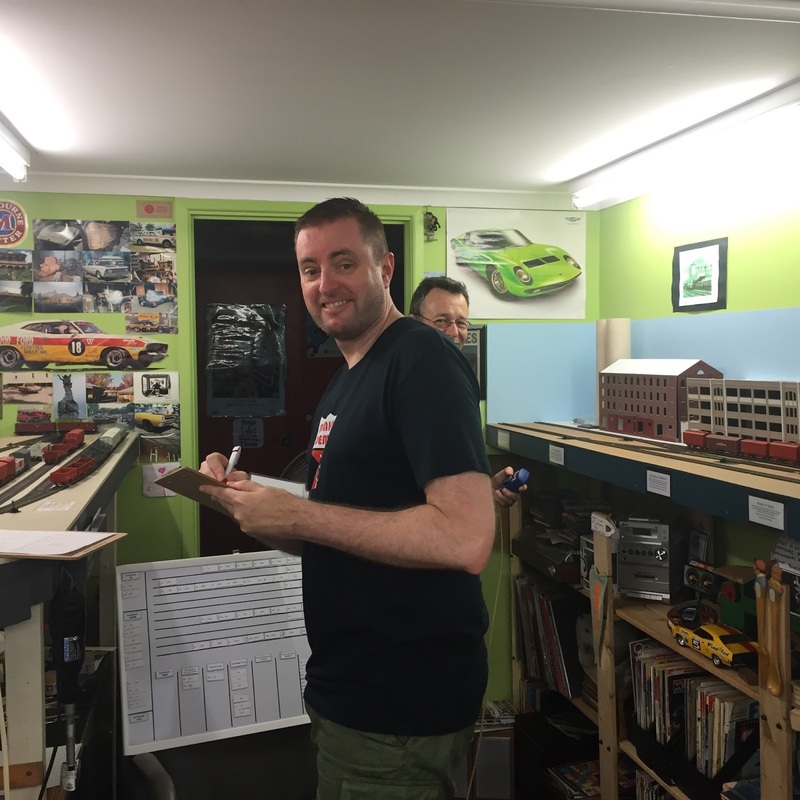 Today I went down to the shed and run a narrow gauge train from Acacia Ridge to Clapham and around Clapham yard to test out the track. I have two operations sessions scheduled for this coming week. Next Saturday will have my first narrow gauge trains running. That could be a problem, as some of the dual gauge track that I scratch built around two very large curves are causing some issues. We will see. I also ran my track cleaning train from Clapham Yard to Acacia Ridge and back, then all around Clapham Yard, then back all the way back to Grafton. It gave me no issues at all, so the track seemed to be rather clean. It must be the Wahl oil I have a been using lately, although I did give it another coating. Everything is currently set for Wednesday's first Operations Session. I will leave you with some photos of yesterday's successful Operating Session with Mark and Anthony at Arden Street. Five industries are situated along this stretch of track. This is where most of the current shunting takes place. The track work is about to be slightly changed here. I need one of these gantry cranes for Rockla Sleeper Siding. This has given me some ideas on how to build one. 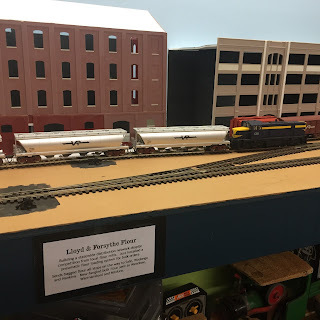 The loco depot after which the layout is named. The two other operators. Layout owner Mark on the right and fellow Mexican modeller Anthony on the left. This time Anthony turned around for a look. He is busy writing up the next shunt for the me the pilot to take around the layout. 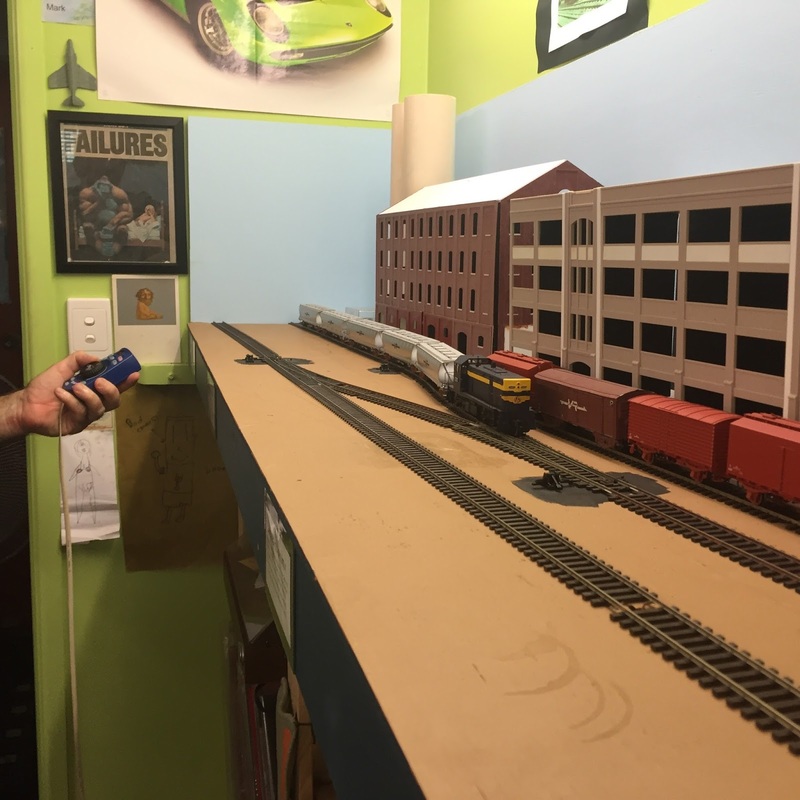 This is the originating yard where all trains are made up from. Apparently it is about to be widened by another maybe 2 or 3 tracks. The industries are taking shape. Some shunting taking place at the local flour mill. 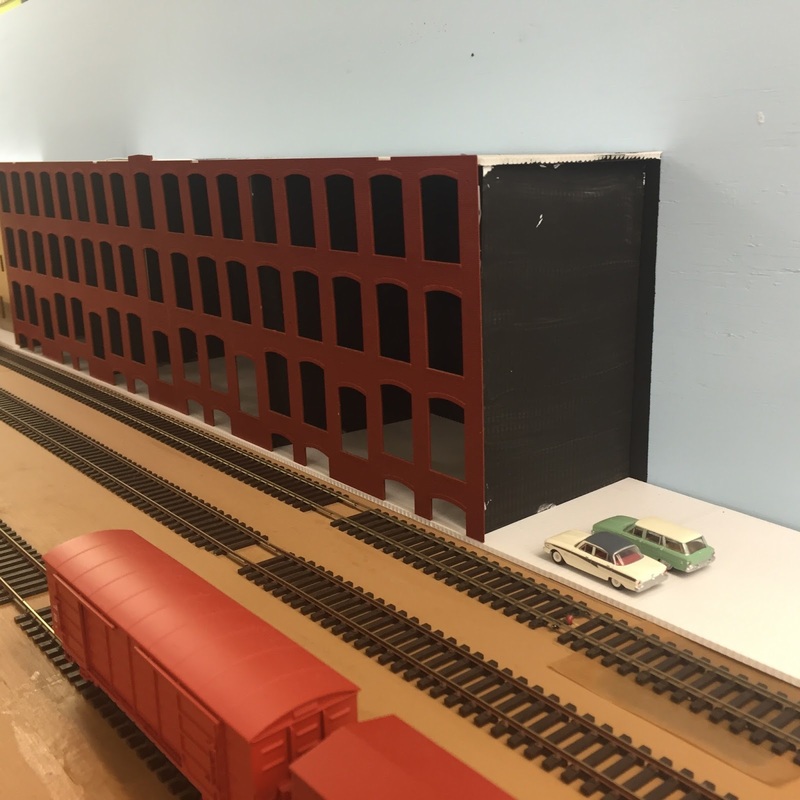 There is also the possibility that the layout will be extended off to the left out through the door, with another yard on wheels located around the corner so some mainline trains can enter and leave the layout. This will simulate locations farther west. The harvester company has a lot of wagons in its siding. It is possible that the trackwork here may be slightly tweaked. The diagram of the Yard. Looking out to the main line (if you call it that) from the yard. There are even two NSWGR wagons on the layout - providing steel plate to the harvester company. These buildings are going to look great when the are completed. Merry Christmas everyone. I hope you enjoy some relaxing time off work, and spend it with those people that mean the most to you. Tell them how much they mean to you and just have a great time. Stay safe if you are travelling. After a fantastic week away from work on holidays down the coast with the family the previous week, my mood suddenly took turn to horrific, when I had to go back to work, and stuff-up after stuff-up was uncovered when I got back to work. I just think I am surrounded by turkeys and they are not the edible types. Well it truly was a bad week back at work. Anyway, I left early on Friday and a group of us ventured over to Brendan’s for a BBQ and a modelling night. In attendance were Geoff, Darren, Grover, Anthony and of course myself and Brendan. Dinner was great. Besides BBQ snags, we also had some kebabs and a bit of a salad. We again spent quite a bit of time just talking, looking at Brendan’s progress on his VR layout and did I mention talking. Oh of course we may have a coldie or two or three while we were talking. The night ended up why Brendan producing a mango cheese cake (made by his better half) and we had a great time demolishing most of that. And no we did not get to any modelling. To put a big U turn on my week, later in the evening, Brendan presented all of those in attendance with a Christmas gift. Wow. Totally unexpected and out of the blue. I received a KLY wagon and a NSW North Coast DVD. Damn Brilliant. Thanks for the present Santa Brendan. Saturday started off with a mow of the grass as it was starting to look pretty overgrown after not being touched for two weeks. This was followed by a trip to a local Umart to pick up my new Raspberry Pi and a power supply. Next up was a trip east to my next appointment for a stop off at a burger bar over near Anthony’s place where 6 of his Operating Crew gathered for a Christmas Lunch. About 50 minutes later, 5 or the 6 were back at Anthony’s for his regular Operating Session. Luckily I was admitted, because I left my radio throttles at home. Oops! Sorry I won’t do that again. The Operating Session at Anthony’s was another great one. I won’t admit to doing a ‘Craig’ with my first train = np one noticed anyway. I also will not admit to not swapping over the loco cards on another of my trains when I did an engine swap at Tatiara Downs. But I slipped back and quietly returned the cards to their correct place without anyone knowing. However, I did see the owner driving his loco down the grain loading siding, way past the outloader, in contravention of his operating rules. When the session ended, we always sit down and have a chat. Anthony then produced a bottle of wine each for his Christmas crew. A very nice gesture indeed. Thanks Santa Anthony. Today after cleaning the pergola and the outdoor setting for next Tuesday night’s gathering at my place, I went down to the shed and wired up my new Raspberry Pi that I picked up on Saturday. It fired up in seconds. I changed the settings, rebooted and I was away. However, I still have issues with my wifi devices not responding when I tell them to do something. Well it is starting to look a lot like it is the wifi dongle. Damn. I may be able to swap mine for another as a trial, to determine if that is actually the cause. I have an upcoming operating session, so I might have to seek some assistance to remove the external wifi dongle and use the internal wifi in the new Raspberry Pi. There is more than one way to skin a cat. However, I don’t know how to do this type of work. So the Pi will now be packed back up and wrapped up and put under the tree for another week. As said previously Tuesday is the last get together for our Tuesday Nighter’s group before Christmas and indeed New Year, but Santa will not be present unlike the two other events mentioned above. Well another club event has been run and boy was it a very nice day yesterday at the Club. In the lead up to Saturday, I spent the last week down the coast with the family and was able to relax going to the beach each day and having fantastic weather. I did not get up to much modelling activity but I did relax by doing a bit of reading and a bit of tennis with my son. There was cricket on TV for the first 5 days and I could not get motivated until Thursday, when I decided to try and decal my FAM coach. I knew that the decals I was going to use were old, and I had heard many stories about people using old decals, and thought that was not going to happen to me. Well I was very wrong. The decals just disintegrated in water after 3-4 seconds. That was a bit of a shame. I texted the boss who was out shopping asking her to pick up some clear nail polish (you can never have too much of that stuff). Upon her return I coated the next lots of decals with the clear nail polish and allowed then to dry. So on Friday I then tried re-decaling the FAM coach and low and behold, the decals did not disintegrate. I did have trouble separating the decal film from the backing paper, but eventually with a little persuasion the decals came away and they were able to be positioned on the coach. However, I then had the decal resting on something when I turned the coach over and that stuffed up the decal. That is a newbie issue that I just slapped myself for. So my coach went from being a pristine coach to a dilapidated coach with the decaling half coming off the wagon. Oh well – I could model that. My next task was to complete about a dozen 6’ x 4’ box trailers. Basically all I had to do was fit the axle and the wheel hubs to each wagon. So after an hour or so, that was complete. However, my plan to paint the trailers a nice new silver colour down the coast, came to a thundering halt. It was blowing a gale on Friday afternoon, I was going to do it over at the beach so that was not possible and I certainly was not going to do it in the unit we were staying in. So on Saturday morning, after getting home from the coast, I went down to the shed and set up a base to paint on, and then I spray the collection of trailers. 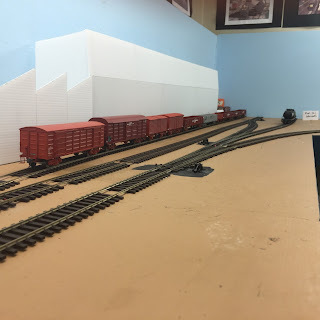 I then let then dry and after about 40 minutes, I placed a selection of 20' x 10' sheets of concrete reo into my 40’ container flat and added 8 of my 6’ x 4’ trailers to the load. It was then time to head over to the Christmas Party. As I said earlier, it was a very nice day. No traffic on the way to the Clubrooms. Not too hot, and there was a nice breeze blowing. There were about 8 tables set up in the Club meeting area, with table cloths and Christmas decorations on each table. I added my donations to the various Christmas Hampers and purchased my non winning tickets for the various drawers to be undertaken later. We had a very nice sit down lunch of cold meats and various torts. A fantastic feast to end a year. Thanks must go to the organisers of the food and setup of the Clubrooms. I had three of the Auscision Coil Wire Wagons to sell, and the first person I spoke to about buying some, said “Yep, I’ll take three”. Well that was easy. I unloaded my modelling competition entries onto a table and that became the modelling comp table. Of course I had a cold drink in one hand while I was doing this job. I then went around and started to advise members, that there was a model of PK on the modelling table. I just wanted to get a few laughs. Everyone did! I must admit that our Club member Greg, certainly put in in preparing the Club Modelling competition for the Annual Christmas Party and I was totally disillusioned that only Greg and myself put in entries. I thought it was really poor form by the other members. I know people are busy, but the members must have worked on something during the year. I know that there are some fantastic modellers in the Club, so my goal now is to try and convert a club full of plonkers into about 10 to 15 people each putting in an entry in next year’s modelling competition. Well on that subject, this year with so few entries, everything rolled up into two categories. These were Dioramas, and the People’s Choice. 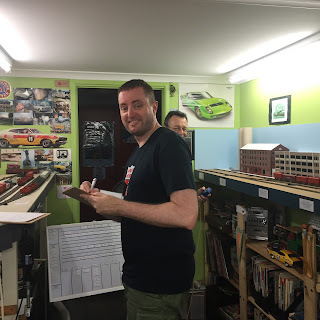 Greg did a really good effort on his oil depot diorama and I thought that my model of PK’s shed might cause enough of a stir to get the popular vote by our members. How wrong was I. It turned out that I won both trophies with my Chicken Coop entry. I was very happy, but I bit embarrassed that I had 5 out of the 6 entries on display. So my attention now turns to planning for my Operating Sessions that are scheduled for the week after Christmas. 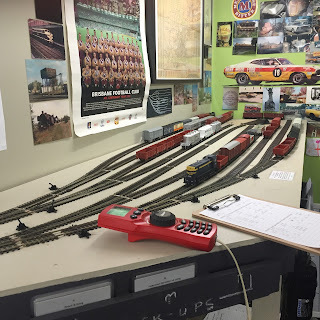 I will need to clean the track, ensure the timetable cards are ready, the trains are in the right spots for when we start the session and the food and drinks are ready. 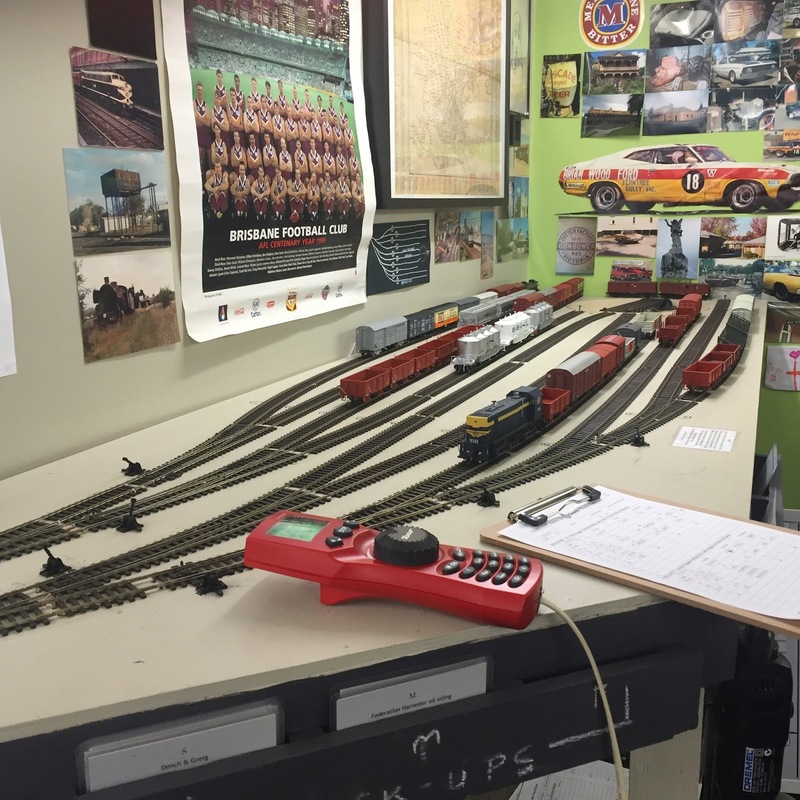 I might also have to clear the desk used by North Coast Control and update the train magnets in case the controller wants to use them to track the trains on the day. I have also been doing some more work on planning for my presentation at next year’s Modelling the Railways of Queensland Convention presentation. I will create two identical base boards over the Christmas break to start things rolling. 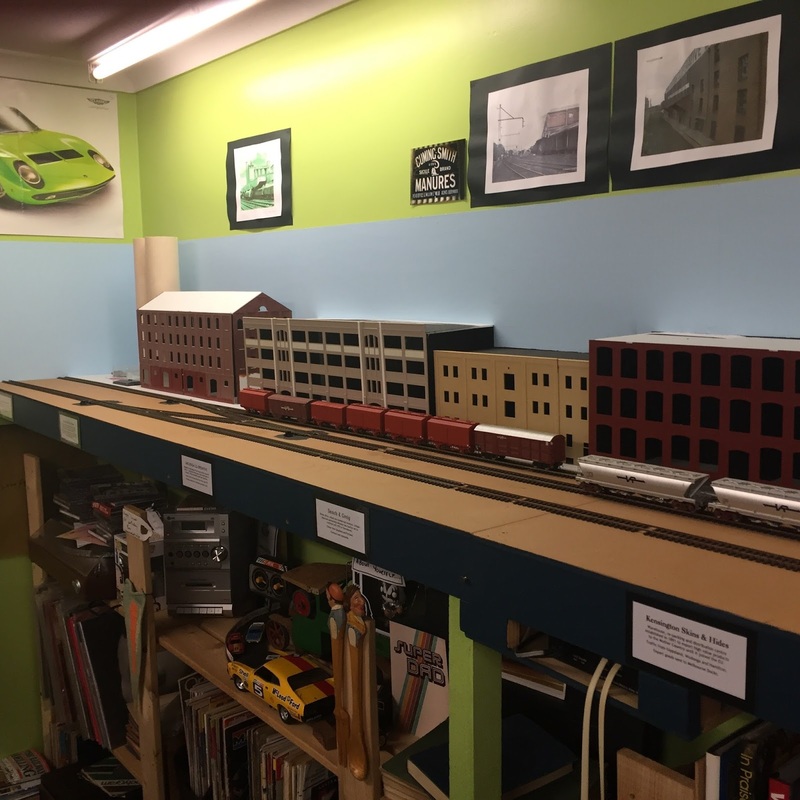 A rail side view of my scratch built Old Cassino goods shed. A view of the road side of the Old Cassino goods shed. PK's Shed with his clothes line. PK's neighbour's dog is hanging from the clothes line after grabbing onto an old skipping rope. PK is the guy drinking with a huge white Santa type beard sitting on the ground. The Other guy is his neighbour. Greg's Oil Depot. It had working gates. A view of the whole diorama of the oil depot. Greg's enhanced kit turned into a diorama. It will eventually be installed on the Club Layout. A shot from another side. The oil depot on the layout. Another view from the layout. Yet another view from the layout. And another. There are also cracks in the bitumen base that the oil depot has laid. Even some weeds growing behind the shed. The Chicken Coop. The hen house (obscured by the apple tree in this shot) has a ramp up to the pen house for the chickens to walk up, and the door on the pen door does actually pivot/swing back and forth. The chicken are all over the place with some inside and some outside the pen. 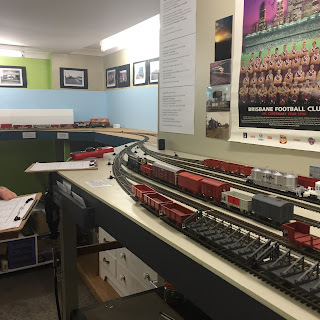 This week on Tuesday I attend the Modelling the Railways of Qld Convention Committee meeting and we did some program design for the upcoming convention in October next year. At the end of the evening, it looked like I was volunteered for a presentation, just when I thought I got away scott free. Oh well. This upcoming convention should be a ripper. I have been planning my session at a very high level outline already. I have 12 months to put it together. I have also been doing bits and pieces this week to help complete the Old Cassino Good shed. So finally on Friday night it was completed. Friday started off with mowing the lawn in between showers. So after that was complete, I then concentrated on the models for next weekend. The goods shed had a final extension completed and painted and it was all put together. However, I decided not put it on a diorama. It is on a base, but that is all. Next it was a revisiting of PK's shed. It didn't take long before I realised that the glue I used to affix the corrugated iron to my styrene on PK's shed had caused the styrene roof base to warp. So, back to the drawing board and I made up a new styrene base for the roof. This time I used aquadhere to affix the corrugated iron to the roof base. I they had to reattach the gutters and the down pipes, and that took no time at all. The next task was finding the decal settling bottle in the shed. Well I eventually found that and I am ready to get into that sometime this week. I then started to think about the venetian blinds that the FAM coach needed. Well I decided to make up a tool from an old AMRM article from Ian Black (I think). Well it actually worked. It was 12 knife blades that I draw across the clear styrene. I will cut these up and fit them while watching the cricket over the next few days. I still need to complete a few loads for my container flat. Again a task for this week. It better be, as time is running out. Luckily I'm on holidays so should have some time up my sleeve. I could not get motivated this weekend to progress anything. Too many family activities. However, slowly but surely I am completing these models.